Everyone has their habits, from biting our nails to shaking our legs, that come out when we need comforting. And when we say everyone, that also means Meghan Markle. There's one thing that the future royal does a lot of ... touch her hair. "Some people touch their hair, play with their fingernails, or rub their arms, as a way to psychologically and physiologically calm themselves when they're feeling anxious, uncomfortable, or stressed," body language expert and author Blanca Cobb told Good Housekeeping. "Some people might touch, twirl or stroke their hair when in awkward social situations such as when they're not sure what to do or what to say." With the world watching her every move (and these photos lasting for years to come), we can see why Meghan would feel nervous during photocalls or public appearances. 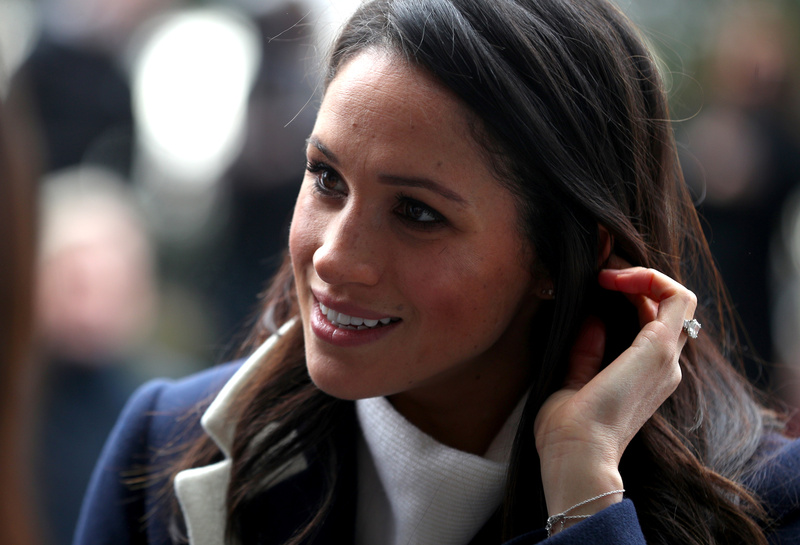 "In this situation, Meghan's hair touch is a soothing gesture," Cobb said. " Her head is also tilted down slightly. Sometimes when you feel too much attention you might tuck your chin down as a way to shield yourself." But it's nice to know that at the end of the day, the future roal is just like us mere mortals and needs soothing from time to time. Wearing hosiery is reportedly an unspoken rule for female members of the royal family, and one that Queen Elizabeth is a stickler for. Meghan Markle defied tradition when she went sans tights for her engagement photos. Meghan Markle made history when she became the first fiancée to spend Christmas with the queen at her Sandringham residence. Usually, events with the queen are reserved for spouses of royals. When Kate Middleton was engaged to Prince William she wasn't given that special privilege and instead spent the holiday with her own family. There's no rule (that we know of) that claims royal ladies must have perfect blown out tresses for all royal engagements, but it's a look we've become accustomed to since Duchess Kate came into the picture in 2011 with her glossy curls and impeccable chignons. In Britain, traditionally the groom, father of the bride, and the best man make speeches after the wedding. However, the former actress will make a speech at her May 19 ceremony to pay tribute to Prince Harry and his family. Royal couples usually refrain from showing PDA in public -- a precedent set by Queen Elizabeth -- but it seems as if Meghan and Harry can't get their hands off each other! Royals aren't allowed to give autographs for security reasons, but Meghan Markle made an exception for one 10-year-old girl. Again, for security reasons, royals are usually required to keep their hands to themselves (handshakes are okay). However, Meghan Markle defied that rule when she gave a group of children hugs while visiting a community center. Usually, the dark hue is reserved for somber occasions like funerals or events like Remembrance Sunday Service. In fact, you'd never see Duchess Kate stepping out in an outfit like this for any public appearance. Meghan Markle shocked and stunned the world when she showed up to a black-tie affair with an Alexander McQueen suit on instead of a ball gown. While there's no official rule that royals must wear gowns, the move broke from tradition in a major way. Holding clutches during public appearances is usually the norm for members of the royal family. Because protocol states you shouldn't offer your hand to any member of the royal family, Kate opts for clutches to avoid any awkward confrontations. However, Meghan surprised everyone when she stepped out in Scotland with a crossbody. When she appeared alongside Duchess Kate, Prince Harry and Prince William, Meghan Markle expressed her support for the #MeToo and #TimesUp movements. It was a surprising moment considering protocol forbids members of the royal family to take sides on political issues. She does it again! Meghan rocked a chic side bun during a surprise trip to Ireland, but just like her messy bun, it's an uncommon style for royals to rock.